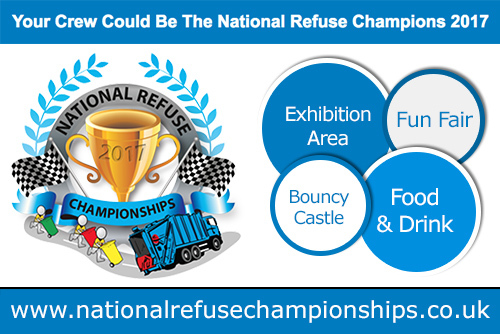 There has been a huge show of support, and competitive spirit, from the waste sector for the National Refuse Championships, due to take place at 10am on Saturday 10 June at Weston-super-Mare seafront to raise money for the Alzheimer’s Society. The competition is open to all independent waste & recycling companies and councils. Over 15 teams have already signed up, including Biffa, Amey, Hills, Devon Contract Waste, Simply Waste, ASL Environmental, Weir Waste, Equinox Recycling and Cartwright Skips. Sponsors, lead by Dennis Eagle, include Epic Media, NTM, Boughton, Gullivers Truck Hire, and Vehicle Weighing Solutions Ltd (VWS). The event, which promises to be a fun day out for the whole family, includes a small fairground and bouncy castle, as well as food and drink for participants and their friends & families. The day will round off with a fish ‘n’ chip supper by the sea and live music provided by tribute acts Tom Jones, Elvis and Rod Stewart, plus The Wurzels. The race involves 32 teams of 5 people working in pairs (including one driver) loading large wheelie bins with stones and pushing them 50m to empty into awaiting refuse vehicles. This gruelling process is repeated as the trucks move forward in 50m stages towards the finish line. The race will start with a series of timed heats during the morning culminating in a final race between the two remaining teams in the afternoon. Members of the public can watch the games from the promenade and seafront.